Basketball icon Yao Ming will carry China's national flag at Friday's opening ceremony for the Beijing Olympics, a senior Chinese sporting official said. "After serious consideration, we have decided that Yao Ming will be the flag bearer," Cui Dalin, the deputy chief of China's Olympic team, told reporters in Beijing on Thursday. "Only those athletes with high sport caliber, good sport ethics and good public image could be chosen to carry the nation's flag", Cui added. 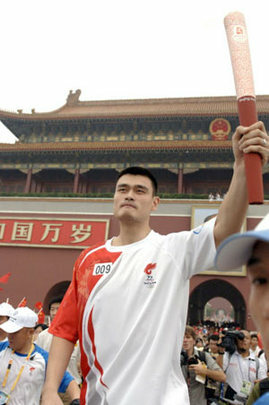 Yao was considered the most likely candidate this year due to his international fame and impressive height (2.26m), even though he did the job four years ago in Athens. Since 1984, China has assigned the flag-bearing honor to men's basketball players like Wang Libin (1984), Song Tao (1988), Song Li (1992), Liu Yudong (1996 and 2000) and Yao Ming (2004). The main rule guiding most Olympic teams when choosing a flag bearer is to choose either the best or the most unique athlete. Tennis star Roger Federer, for example, is the undisputed choice for Switzerland. He set a record for holding the world No 1 ranking for a record 238 consecutive weeks and has won 12 Grand Slam singles titles. Federer, who will be celebrating his 27th birthday on the day of the ceremony, also led his country at the opening of the Athens Olympics four years ago.